The pavement on a segment of 12th Avenue S.W., one evening in April 2016. Albany seems to be headed for an election on a local fuel tax of 5 cents a gallon this November, judging by the city council’s discussion Monday. The tax might raise about $1.25 million a year for street repairs. There was no vote, but council members agreed that if there is to be a local gas tax, it might as well be 5 cents rather than 3 cents as previously discussed. It would apply to gas as well as diesel fuel, would take effect all at once rather than be phased in at the rate of one penny a year, and would have no planned ending date. The council also said the city should not hire a consultant for this issue. Councilman Bill Coburn argued for going to the voters in 2018, in either the primary or general election, when the city would not have to bear the cost of the election. The cost of a special election this Nov. 7 might be as high as $30,000, depending on whether there are other jurisdictions with issues on the ballot. A delay would also give the city a chance to redirect some funds toward the street fund first, Coburn said. Several hundred thousand dollars in former street funds was budgeted for other programs during the recession, when the city faced budget and personnel cuts. 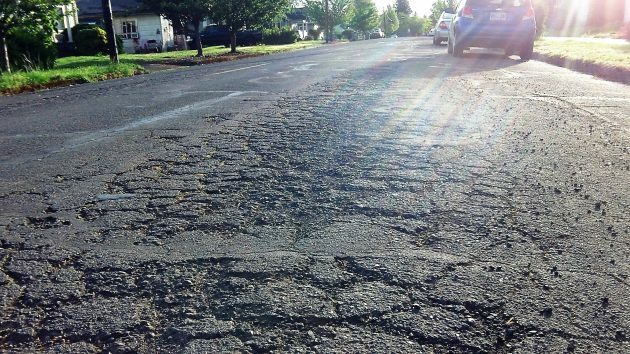 One question was left unsettled: Which streets would get fixed first if the tax passes? The city staff will draw up a list for the council, but chances are most residential streets in bad shape will stay that way for many years. Last year, a council member made the point that repaving just two blocks of a residential street now costs about $750,000. At best, even a tax that yields $1.25 million a year will leave most streets unchanged for a long time. The Pepsi settlement money was spent on other things, most recently to help pay for the police and fire stations to keep taxes down. Wasn’t that settlement supposed to reimburse the city for money they had spent preparing infrastructure for a plant that never materialized? But instead of refunding it to the agencies that spent the money originally, it was seen as a windfall and spent on new capital improvement projects which, consequently, require even more maintenance. “Keep taxes down?” Hasso, I thought you were wiser than this. Wise or not, the facts are that the facilities are costing more than the bond issue people are paying off with taxes. Using a big chunk of the settlement made that possible, so it kept taxes down. Your definition of ‘big chunk’ is different than mine. The city received $20M from Pepsi. They gave $1.4M of this fund to the new police/fire buildings. That is 7%. Micro-chunk, maybe. It would have been better to give $10M, or 50% of the Pepsi fund. Now that qualifies as a ‘big chunk.’ and it would have significantly reduced the need for an $18M bond. Better yet, the city could have added about $8M of CARA money and avoided the bond altogether. But hey, it’s no fun using CARA in this way when you can spend the slush on non-essential stuff like streetscapes, etc. If each Albany-Ian would run out and purchase a Chevy Bolt, or a Tesla, this .05/gallon gas tax would do little. Or ride a bike for trips within town. Not many solution -driven responses here. Yet the streets keep in crumbling. Let’s vote. But first, let’s understand that our infrastructure – streets, electrical grid, waste drainage, public buildings are all failing. The rate of accelerated deterioration is easy to track if you use these facilities, streets, etc. How good of a job have we done maintaining over the years? And while we dithered, the costs kept accelerating. We are told we need replacement of these assets, the most costly curve of spending during a time of construction costs at their highest levels in 25 years. So, let’s vote, but let’s first talk about this problem and all the possible solutions.